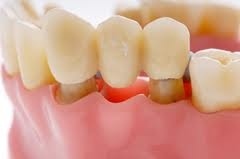 The process of making a bridge begins by preparing your existing teeth where the bridge will be attached. The existing teeth are recontoured to provide a base for the bridge. After the teeth have been prepared have been created, a mold is taken of the area which is sent to a dental lab. The lab is able to use the mold to create a bridge that will fit properly and feel as close to your natural teeth as possible. The bridge consists of two crowns on either end to place on the abutments and a pontic, which is the new tooth that replaces your missing tooth.